Induction of inhalation anesthesia in rodents has traditionally been accomplished via a chamber or bell jar. The animals are exposed to an appropriate concentration of anesthetic vapor and O2 until they are rendered unconscious. Removal of the animal usually exposes the investigator to unacceptable levels of waste anesthetic gases. The vented induction chamber will eliminate exposure to waste anesthetic gases that are most common with traditional induction chambers. The patient is placed into the chamber via a sliding lid. With the lid in the closed position, anesthetic vapor/O2 is introduced into the chamber in the standard fashion. A constant vacuum is applied above the chamber to capture excess gas as it leaves the induction area. 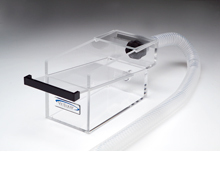 When the lid is opened, this vacuum creates negative pressure above the chamber, allowing safe removal of the animal and preventing excess vapor from reaching the investigator. Overall: 13.0" x 5.5" x 6.0"
ceiling height that slopes from 4.2" to 3.2". Click here for the 2-Liter Vented Induction Chamber Independent Test Data.